Since 2006, thousands of people have participated in over 400 Peoples Movement Assemblies (PMAs). 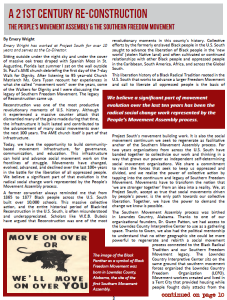 Community organizers across the United States have used the PMA to gather people affected by injustice, analyze what is happening in communities, and create collective plans of actions to address those conditions. PMAs are inspired by global social movements that use large-scale governance practices to establish collective action plans across issues, cultures, and geographies. The Social Movement Assembly was developed as a decision-making space of the World Social Forum (WSF) initiated in 2001 in Porto Alegre Brazil. At each WSF, an Assembly gathers thousands of community members from hundreds of countries to make movement decisions. A historic decision to implement the Global Day of Action against War in February 2003 converged millions of people to take to the streets in sites across the world in a united political action to prevent the U.S. war in Iraq. 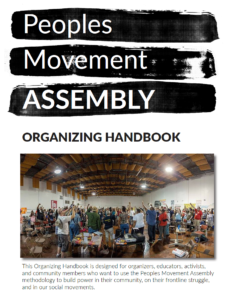 Since 2006, the organizing process of the Peoples Movement Assemblies has grown and evolved in the U.S. One of the first movement assemblies in the U.S. was held in 2006 at the Border Social Forum in El Paso, Texas/Ciudad Juarez. 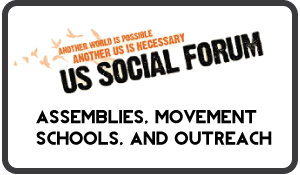 That regional social forum along with the Southeast Social Forum held in Durham, North Carolina, built momentum to converge the first United States Social Forum in Atlanta, Georgia in 2007 with 20,000 people participating. The first national PMA was facilitated with thousands in attendance and resolutions read by over 60 groups. 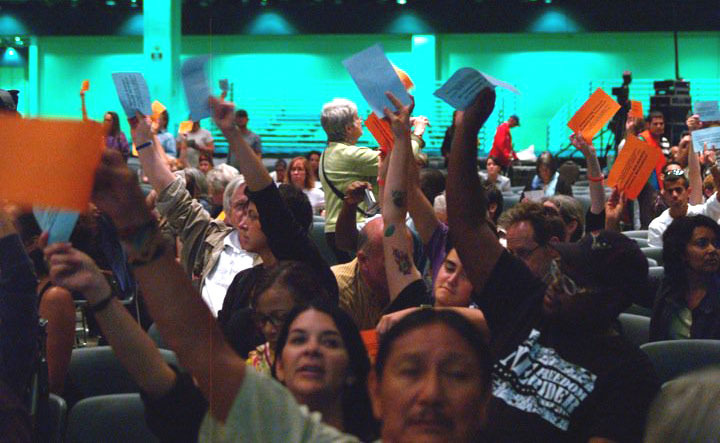 At the 2nd U.S. Social Forum in Detroit in June 2010, 100 Peoples Movement Assemblies convened over 10,000 people, and the National PMA produced a Social Movement Agenda for Action based on the Synthesis Assembly. Communities took the PMA organizing process back home and facilitated city-wide assemblies, frontline assemblies on environmental racism, youth power, immigrant justice, healthcare, economic alternatives, international solidarity and other issues, as well as regional assemblies for movement governance. For Part Two of this video, scroll to the bottom of this page. The new millenium was characterized by ongoing building of movement forces and conservative backlash. In 2001, the first World Social Forum (WSF) took place in Porto Alegre. Also in 2001, the reaction to 9-11 caused a set-back for movement forces. Yet a change in era happened after 2003 when people moved from focusing on committees to talking about movement building and mass organizing. Mega-marches, such as the Migrant Marches protesting change in immigration policy, were widespread in the mid 2000’s. The Global Action to Stop the Iraq War on February 15, 2003, which mobilized millions of people, was the result of a direct call to action from the Assembly process at the 2003 World Social Forum. Yet these marches focused on getting people to attend the march, not on organizing with people to build long-term movement. During the 1990’s the start of a global movement was building. From 1992-96 bi-national mobilizing against the North American Free Trade Agreement (NAFTA) was organized in the US (by SouthWest Organizing Project and Southwest Workers Union) and Mexico (by Centro de Investigacion & Solidaridad Obrera in CD Juarez and Frente Democratic Campesino in Chihuahua). The Zapatista Rebellion in Chiapas, Mexico in 1994 continued to propel Anti-NAFTA mobilization onto the world stage. 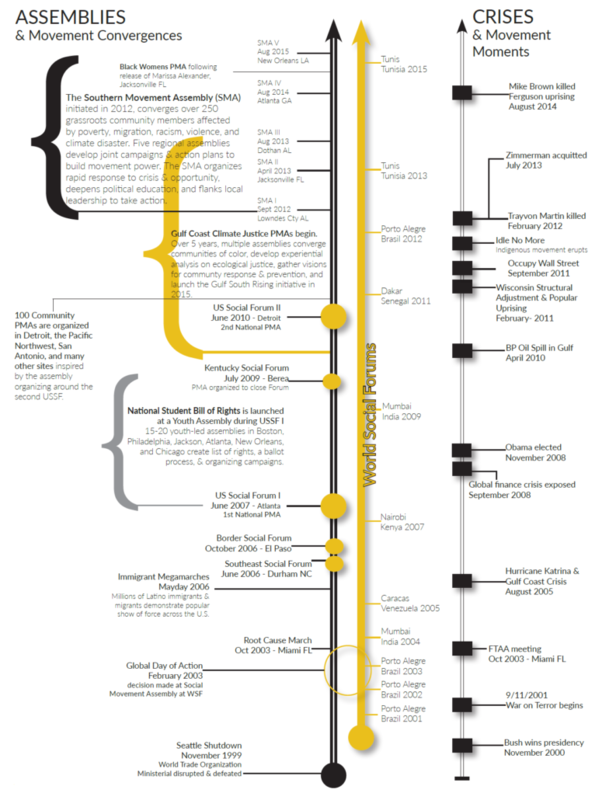 By 1997 global north/south social movements, alliances, and solidarity was building. The“Battle of Seattle” in 1999, where the WTO ministeriel meeting was shut down by movement forces, was a landmark coming together of the global justice movement. Historically this action played a very important role; organizers returned to Brazil from Seattle and began organizing the first World Social Forum based on the idea that the movement needed to have it’s own meetings to construct it’s own vision and agenda. The idea and hope was that only together could we discuss alternative directions for our world and society. In 1979-80 there was an era change. While COINTELPRO and the assasinations of movement leaders contributed, many liberation and identity movements collapsed because we didn’t have the analysis to change our strategy from what had worked in previous decades. In response to scare tactics used by the Reagan administration, people veered away from political organizing and focused on working in the community sector. There was a lot of fragmentation between different political struggles as people concentrated on issue-based organizing. This focus brought many new people into the movement and resulted in many new organizations being created. Yet many of those involved, while ready to fight specific targeted fights, were not prepared to fight for the long battle for liberation. Similarly, the focus on specific issues meant that people that were working in parallel to each other. People understood that they needed to build intersectionality between issues, this was approached mechanically, whereby the goal was to create partnerships between organizations and groups working on different issues, and was not based on new analysis about the current political moment and the impact of issue based organizing. In the 1970’s, there was a populist upsurge. Marches against the Vietnam War drew thousands of people; 100,000 people participated in the Kent State Massacre/Cambodia Incursion Protest in Washington, D.C. in May. There continued to be one symbolic leader who was seen as the spokesperson for the movement; but during this time the symbolic leader was backed by a populist movement. The synergy and momentum that was building met a glass ceiling: energy was not put into developing new leadership to be able to sustain the momentum. This era of organizing can be understood as like pulling a box car; the populace were engaged by single leaders. During the 1960’s the movements were based on one symbolic leader. While there was mutual recognition between the many groups, for the most part they worked on separate issues. There was often competition between leaders in regards to who could be the most radical or militant.